It’s always interesting to hear from readers whose boats seem reluctant to sail as they should. Every challenge is different – even if some of the same problems do crop up pretty regularly – and when John Taylor got in touch about his Kelt 550, it sounded an interesting one. John and his wife Sheila sail from Brundall in Norfolk, where the River Yare is both tidal and narrow enough to call for frequent tacking. John’s suspicion that the boat wasn’t going properly was confirmed on one occasion when a couple of other yachts tacked straight past him and left him struggling to stem the tide. Something had to be done. Talking to John before my visit, it was clear that he was no novice: he had sailed on competitive quarter-tonners on the Blackwater for several years, and had also enlisted the help of another experienced sailor to make sure he hadn’t missed anything obvious. I headed for Norfolk hoping to find something, but with little idea what to expect. I did, however, know that October Dream had a flat steel centreplate and a flat rudder blade. This would inevitably make her more challenging to sail than the alternative versions of the Kelt 550 that have a fixed fin or a daggerboard, both profiled. 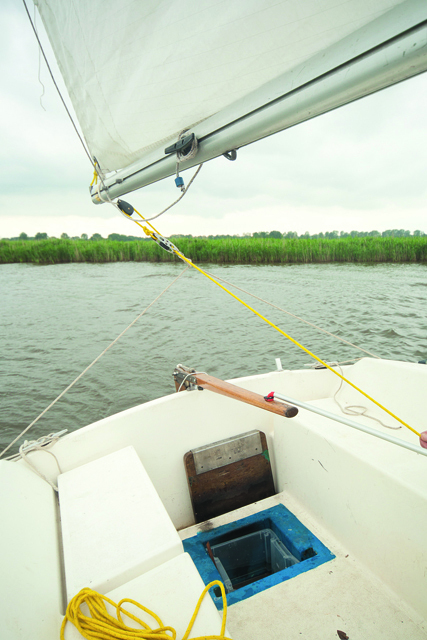 It would call for a different approach to sailing in the confined waters of the Yare. Strong winds caused the most obvious problems, John told me: the helm would become heavy, the rudder would lose grip and the boat would round up. It was then difficult to get her going again, as it was to pick up speed after a tack. Finding plenty of breeze hasn’t been a problem in recent summers. For my visit, ideally we wanted a good wind from the north-east or south-west to give plenty of opportunity to beat against the tide, but the isobars seemed to go on holiday the week we earmarked. All we could do was to meet in Brundall on the most promising day we could find. A quick check over the boat confirmed, as I had suspected, that the rig was set up better than many, though the mast had insufficient pre-bend and what looked like too much rake. As usual in these situations, however, I wanted to sail the boat as she was before making any adjustments – or, more precisely, I wanted John and Sheila to sail and I would observe. Then we would start addressing the problems. From where we started, it was a matter of ‘you have to run before you can beat’, so we set off down the river with the wind astern. Although downwind sailing had presented John with no specific concerns, we were wasting sail area because the mainsheet was too short and only letting the boom out to about 45° from the centreline. As a temporary measure, we re-rove the 4:1 purchase to make it 2:1. In relatively light downwind conditions, 2:1 would still provide adequate purchase while allowing the boom to go out further. It would also reduce friction for easier trimming. 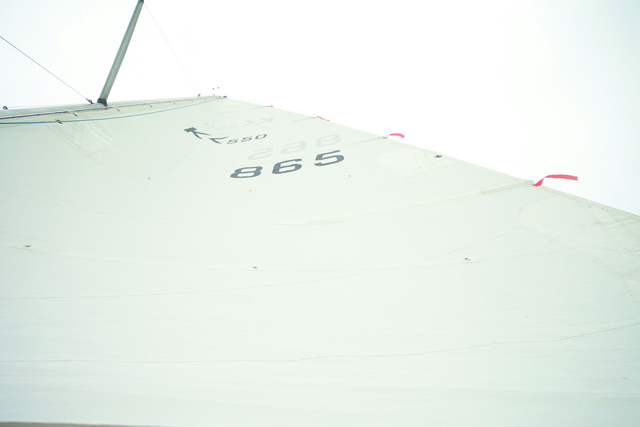 We subsequently changed the sheeting arrangement completely, as we’ll see later, but the point here is that if the boom isn’t out as far as it can go on a run, you’re not presenting the maximum sail area to the wind. You’re also increasing the risk of broaching when the breeze picks up because the mainsail’s centre of effort is further aft. When we reached an open stretch of river with relatively clear wind, I hopped ashore and took some photos as John and Sheila sailed back and forth. In a pleasant 10-12 knots, everything was just fine: the boat appeared to be going nicely and showed no hint of misbehaving. This was evidently the wind-strength equivalent of the Goldilocks Zone: enough to get her going, but not so much as to over-press her and induce any wayward behaviour. he wind soon dropped, however. By the time I was back aboard and we had headed a little further downriver to a stretch that gave us a dead beat back, it was a variable 8 knots or less. That’s when the problems started. The boat was lethargic, even allowing for the lack of wind. 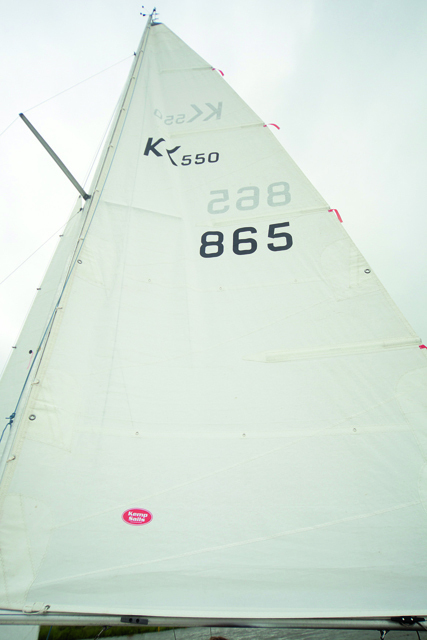 She was slow to accelerate and, on coming out of a tack, would spend a lot of time going sideways with the keel stalled. By the time she eventually got moving, we would have reached the opposite bank and would need to tack again. A number of factors were contributing to this lacklustre performance. The rig was one of them, so let’s start there. The lack of pre-bend in the mast meant that the mainsail was too full, with the draught too far forward and the leech closed so the top of the sail was stalling. The jib wasn’t perfect either, being short in the luff so the head was well short of the hounds. 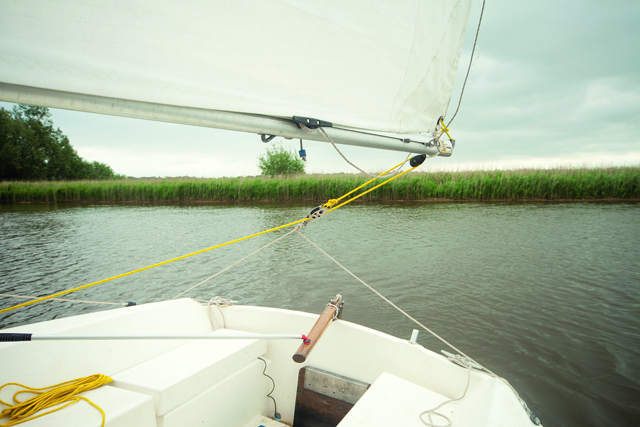 That wasted sail area, and area high up, is doubly critical in a river where the wind sweeps over the reed-beds and there’s often very little at deck level. On the positive side, at least both sails were relatively new. There were things we could do to improve matters in the rig and sail department, but not a great deal there and then. We took some turns on the cap shrouds and reduced the tension in thelowers to try to induce some pre-bend, but soon ran out of thread on the bottlescrews. Several shackles had been added to the bottom of the forestay to make it longer, which had the effect of increasing the mast’s rake and shortening the caps. Excessive rake would have contributed to the weather helm in a breeze and, what’s more, shackles are not designed for applications like this. A rigger would have a fit. 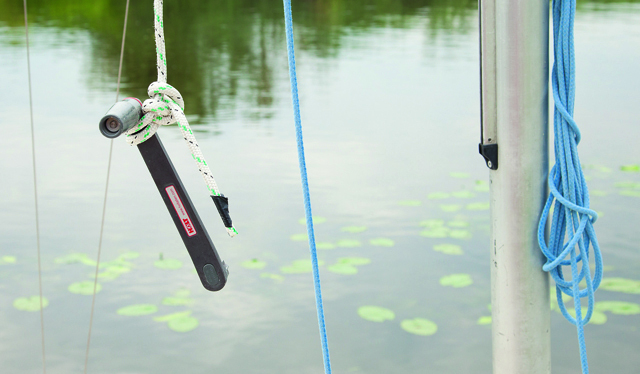 If extra length is needed, a steel link tang is a better solution – a pair of stainless steel plates with adjustment holes, as commonly seen in a dinghy’s rig. A further complication was that the chainplates – simply channel sections of stainless steel bolted hrough the flange of the hull-to-deck joint – were distorted and, most notably on the starboard side, forcing an unhealthy bend into the cap shroud’s bottlescrew. I left it with John to straighten the chainplates and replace the forestay shackles with a tang. That would make the rig stronger and allow the rake to be reduced and accurately adjusted. We have already seen that the mainsheet was too short with its 4:1 purchase. 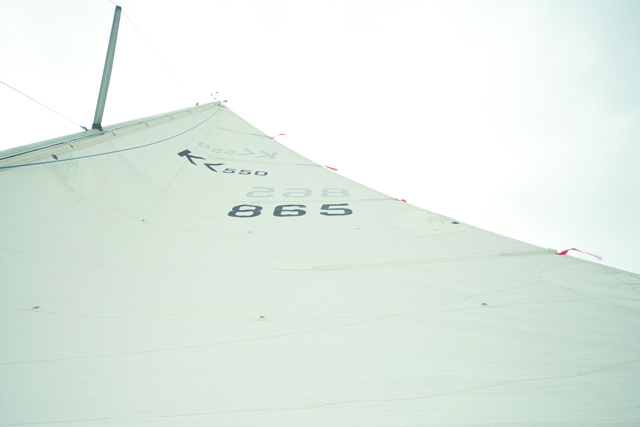 Making it 2:1 instead was just a temporary measure to increase efficiency downwind and reduce friction in light airs. Like many cruisers, the Kelt has no mainsheet traveller. The bottom block is on the cockpit sole, so there’s a long fall of mainsheet and its pull is more vertical than lateral as the boom comes in over the quarter towards the centreline. 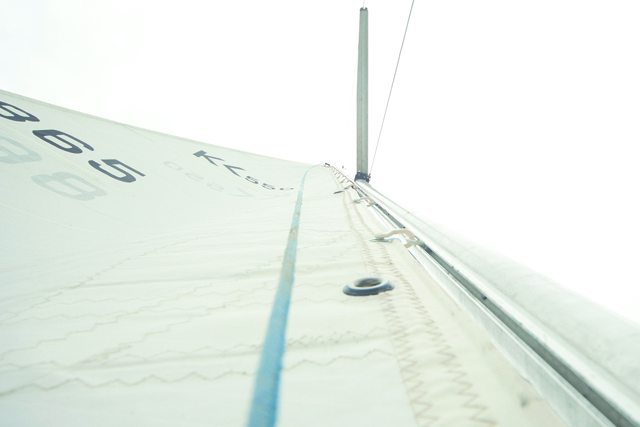 The trouble is that, although you often need the boom close to the centreline for sailing upwind in light airs, the downward pull closes the leech and stalls the top of the sail. That’s slow. If you leave the sheet slack enough to keep the leech open and the telltales flying, the boom will be nowhere near the centreline and the boat won’t point. A systemlike this is the equivalent of a car manufacturer saying ‘we don’t want to confuse the poor drivers or take up space by fitting a gear box and a gear lever, so we’ll give it fixed transmission’. Thankfully, fitting a traveller isn’t necessary on a small boat like this. It’s essentially a dinghy, and the simple answer comes from the world of dinghies: a transom bridle. A rummage through my Sail Clinic travel bag yielded enough bits to rig up a makeshift system that was far from perfect but allowed the boom to be brought close to the centreline with minimal downward pull. purchase – would come into play. Our temporary transom-mainsheet system had a 2:1 purchase. A 3:1 would probably be needed in any breeze. October Dream has a well in the cockpit for the outboard. The trouble is that an outboard in a well creates a vast amount of drag under sail. 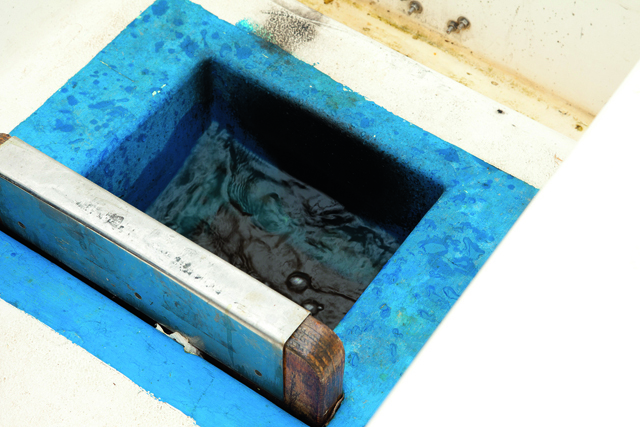 If the outboard is hinged up or lifted out, the drag from the well itself is still substantial. 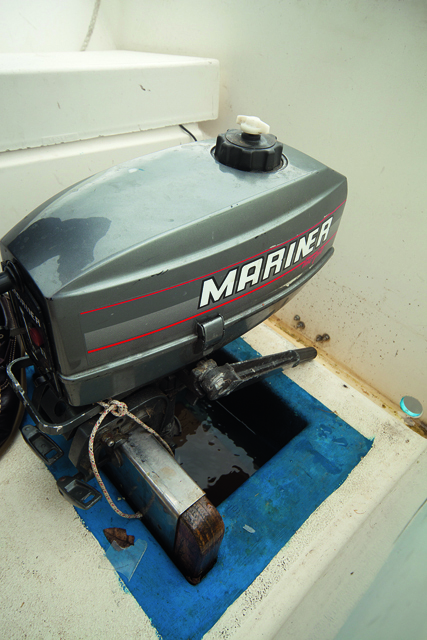 In John and Sheila’s case, removing the outboard and stowing it down below isn’t always practical anyway, because they need it for getting through windless patches in the lee of trees, or to avoid badly- driven hire boats. Whatever its causes, drag means a reduction in speed. 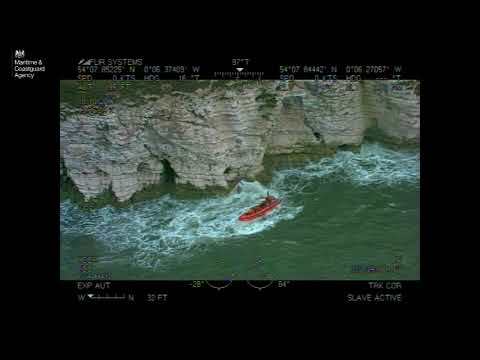 That’s a bad start, but it’s even worse in a boat with a flat centreplate and rudder. Flat foils are much less efficient than those that are profiled, and they need more speed to generate lift. If the boat is going slowly and doesn’t have room to accelerate before having to tack again, the keel never has a chance to start working. So the slower you go, the more leeway you make and, because the rudder isn’t working properly either, the harder it is to tack. One problem leads to another: you’re in a downward spiral. 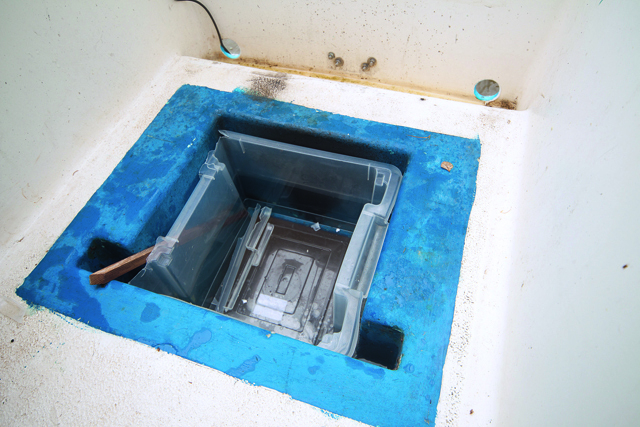 We started by removing the outboard, still noting the sloshing and gurgling from the empty well. 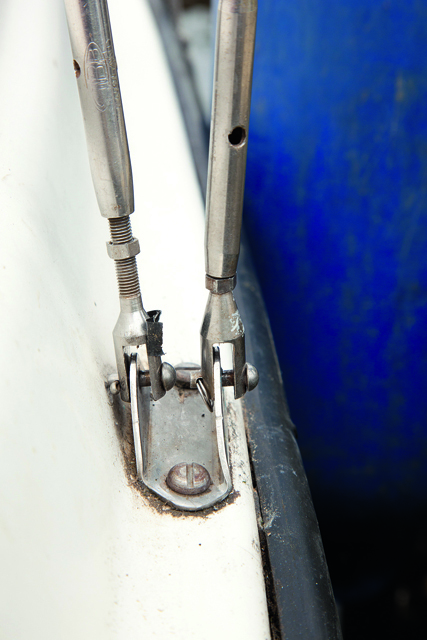 Some boats come with a fairing plug to fill it, but the Kelt didn’t have one. What we did have, however, was a plastic box down below that was used for storing the crockery and cutlery. It happened to be almost the right size and Sheila was willing to sacrifice it. She allowed me to attack it with a knife, cut off the flange and wedge it down the hole with a bit of wood. The sloshing and gurgling stopped instantly: the handbrake was released. My suggestion to John and Sheila was that they have a proper fairing plug made, leave it in most of the time and, for river sailing, mount the outboard on a transom bracket. In flat water it will work fine. When they’re not using it, all they have to do is swing it up clear of the water. It’s ready to drop down and start again in an instant. The outboard will also be a good deal quieter outside the boat. If you live near a dinghy-sailing club on a narrow river, spend some time sitting on the bank and watch how the top sailors throw their boats around. Then apply the same techniques (moderated as appropriate) to your Kelt 550 or any other small, light, beamy, weight-sensitive cruiser you happen to sail. 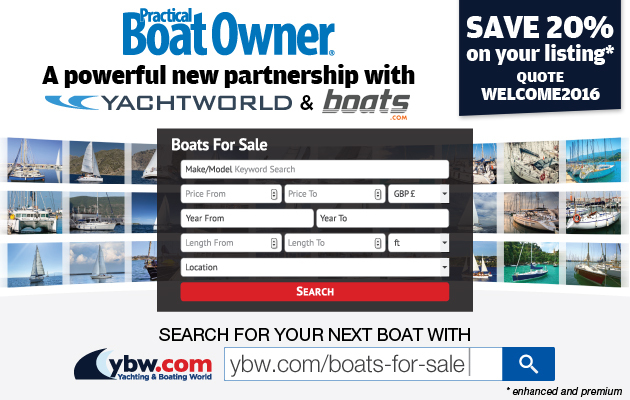 In PBO October 2013 we looked at factors that encourage a boat to turn one way or the other and why beamy boats will often carry lee helm when upright. Lee helm is horribly slow, particularly when you come out of a tack in light airs and need to get back up to speed as quickly as possible. After a tack, heel to leeward to induce slight weather helm while also sailing a little low (free), then gradually harden up and bring the boat more upright as you gain speed. 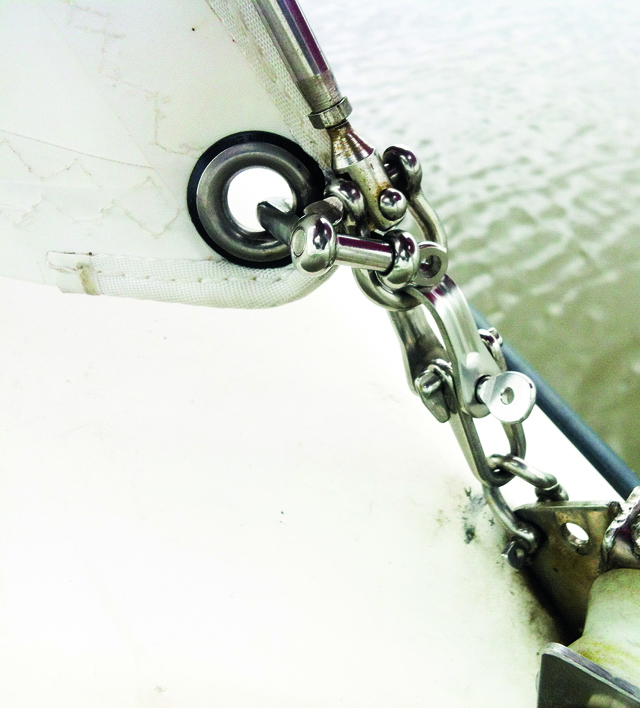 Hard rudder movements are real speed-killers in light airs, so when you need to tack, heel the boat further to leeward as you put the helm down. You’re using your weight to help steer the boat. Don’t sit too far aft, either: you need to get that stern out of the water. Having three people in thecockpit on something like the Kelt puts the weight too far aft in light airs. If you want a gentle, sociable sail, that’s fine. If you have to get somewhere, the third person will need to be on deck or, as Sheila was much of the time on October Dream, sitting on the cabin table. The new mainsheet system helped our weight distribution by opening up the cockpit and making it easier for us to move forward and to leeward. 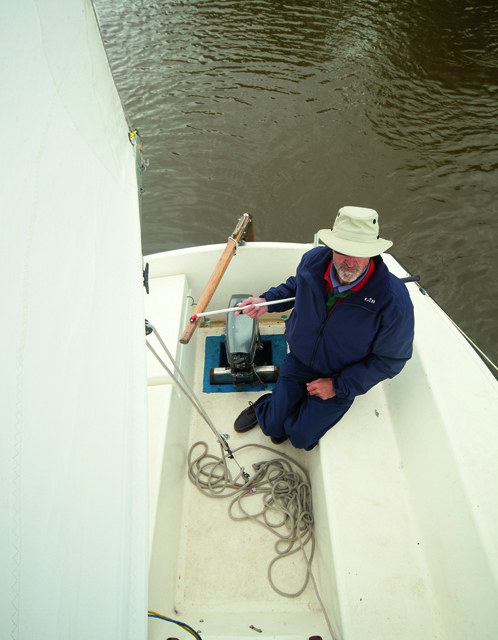 ALL RIGHT NOW: The mainsheet is on the bridle, a small amount of heel neutralises the helm, the ‘fairing plug’ is in the outboard well and John is sitting further forward. What a difference! 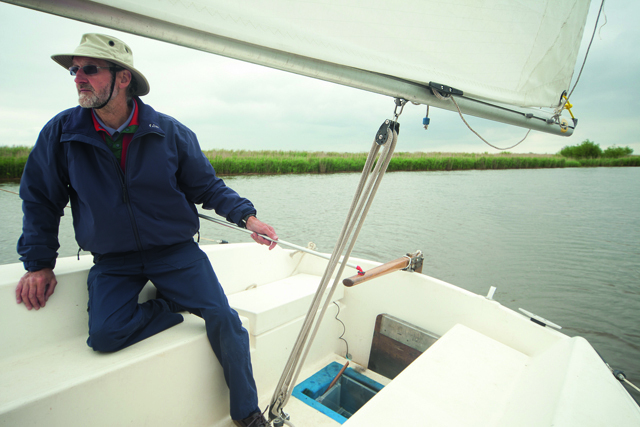 I went to Norfolk hoping to find ways to help a Kelt that behaved badly upwind in a breeze. Instead, we spent an absorbing day figuring out how to get it going in light airs. Once the chainplates and the rig issues have been addressed, a fairing plug made, an outboard bracket fitted and a proper mainsheet bridle rigged up, things should be better right across the wind range. Since a heavy helm is also a problem when the wind picks up, we discussed ways of adjusting the rudder blade to add some balance. All that leaves is a new plastic box for the galley. 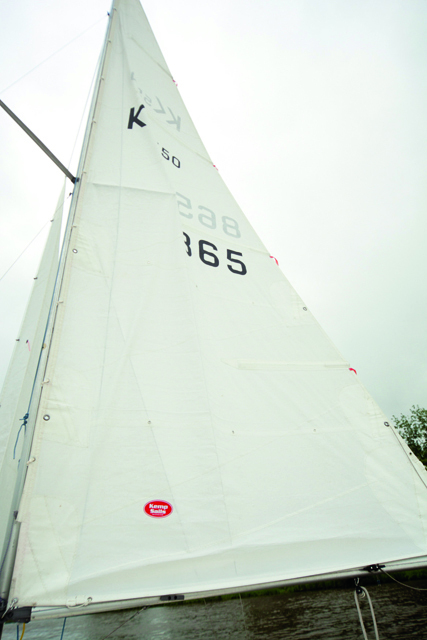 This Sail Clinic article was published in the December 2013 issue of PBO. David Harding has since revisited John and Sheila to see how October Dream is now sailing. Find the follow-up article in the October 2014 issue of PBO, out in the shops on 11 September 2014.